It doesn’t seem possible…but it is. Scotland issued once it’s own passports and they are nowadays scarce to find. If at all, they will be on display or in an archive of the Scottish Museum or National Archive. A unique chance to get a beautiful and scarce travel document into your collection. 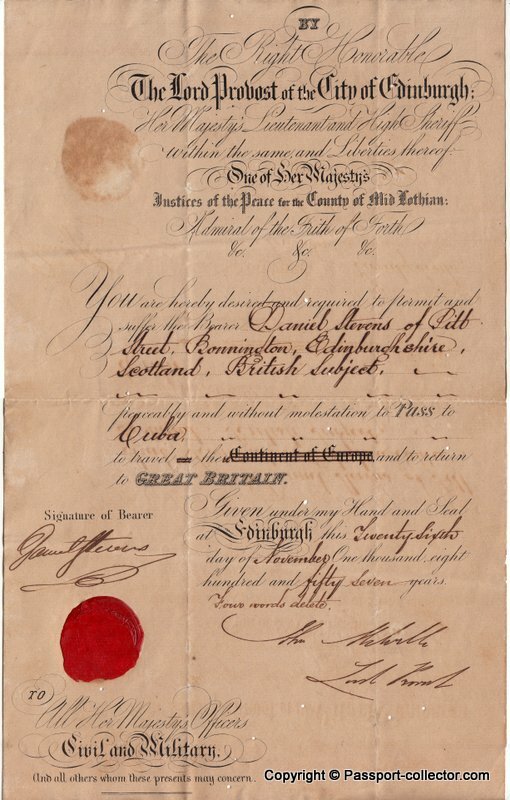 Issued by the Lord Provost of the City of Edinburgh to Daniel Stevens of Pilb Street, Bonnington, Edinburghshire, Scotland, British Subject, to travel peaceably and without molestation to CUBA and return. 25 November 1857. Signed by the Right Honorable Lord Provost of Edinburgh, (Sir) John Melville. Sir John Melville FRSE WS (1803-1860) was a Scottish lawyer and landowner who served as Lord Provost of Edinburgh from 1854 to 1859. Melville Drive in Edinburgh is named after him. He was born in Kirkcaldy in Fife the son of George Melville, a lawyer, and his wife, Isabella Rule of Kennoway. The family moved to Edinburgh in his youth, residing first at 5 Broughton Place then 3 Nelson Street nearby. John studied Law at Edinburgh University. He was apprenticed to Alexander Manners WS based at 12 Nicolson Square. He qualified WS in 1827 and set up his partnership Melville & Lindesay WS. In 1849 he was Chief Magistrate of Edinburgh. He had also created a town councilor in 1853. In 1857 he was elected a Fellow of the Royal Society of Edinburgh. Melville was knighted in 1859 by Queen Victoria at the end of his period as Lord Provost. He died at home 15 Heriot Row on 5 May 1860. He is buried in Newington Cemetery in the south of the city. I did not find any information on Daniel Stevens. The original passport is overall in very good condition, double folio (approx. 8″ x 13″) with several tiny bookworm holes – not disturbing. The paper of the passport bears the watermark of J.Whatman and the year 1856. J.Whatman was a notable paper mill which existed since 1700. The red wax seal is still on the document, but unfortunately, the inscription is almost gone. I assume the passport was folded when the wax seal was still too warm; the wax was deformed before hardened. On the back, it’s written “Passport Daniel Stevens 1857” original text and ink.